When we first brought our daughter home from the hospital, I knew things wouldn’t always be easy. I knew we’d have sleepless nights, I knew she’d fall and hurt herself, and I knew there would be days when I thought I was going to lose my mind, but I never, in a million years, thought I’d struggle to get a toothbrush into her mouth. And yet I did – every single day. It was nearly impossible: What do you do when your toddler won’t brush? In fact, I was still ‘brushing’ her teeth with my finger and a washcloth when she turned 3, but I soon realized enough was enough and that I had to make some changes. So, I did some research on how to teach kids to brush their teeth. I also asked my awesome Facebook fans for their help and insight on convincing kids to use the toothbrush. They shared some great toothbrushing tips for toddlers that I hope will help another poor soul who struggles with this part of parenting as I once did. I’m not going to lie, there were moments when I was wrestling with my daughter every night over a toothbrush meltdown, when I wondered, “How important is dental care for kids, really?” I mean, I know–of course–dental hygiene is important, but don’t kids just lose their baby teeth anyway? Well, it turns out tooth decay is the most common disease among kids! 40% of kids have preventable tooth decay by the time they reach kindergarten. We may think candy and sugar is just part of being a kid, but when kids have dental disease from not properly brushing, it’s painful and leads to many other problems down the road. Oral health is very important! Kids should visit a dentist by the time their first tooth appears and visits should be a regular occurrence every six months. As soon as they have teeth, they should also be brushing daily (darnit). Kids shouldn’t go to bed with juice or a bottle and they should learn about healthy food choices to help keep their teeth strong. Kids who don’t have regular dental care? They can experience a myriad of issues from poor dental hygiene. Tooth pain causes trouble chewing, leading to improper digestion. Tooth problems may cause them to miss out on learning at school, have a hard time concentrating or cause them to get distracted. Dental problems can even lead to difficulties with speech and pronunciation. Young kids with dental disease can also damage their permanent grown up teeth before they even come in! There’s no getting around it–even if your kid hates the toothbrush, it’s got to be part of your regular routine. Kids should brush their teeth at least once, but ideally twice a day. You can even brush your infant’s teeth (or tooth) with a clean piece of gauze around your finger after each feeding. Tooth decay occurs when food sits in the mouth, mixing with saliva. The combination of tiny particles and spit form plaque, which also contains bacteria. It’s that bacteria that causes gum disease and tooth decay, a.k.a. cavities. 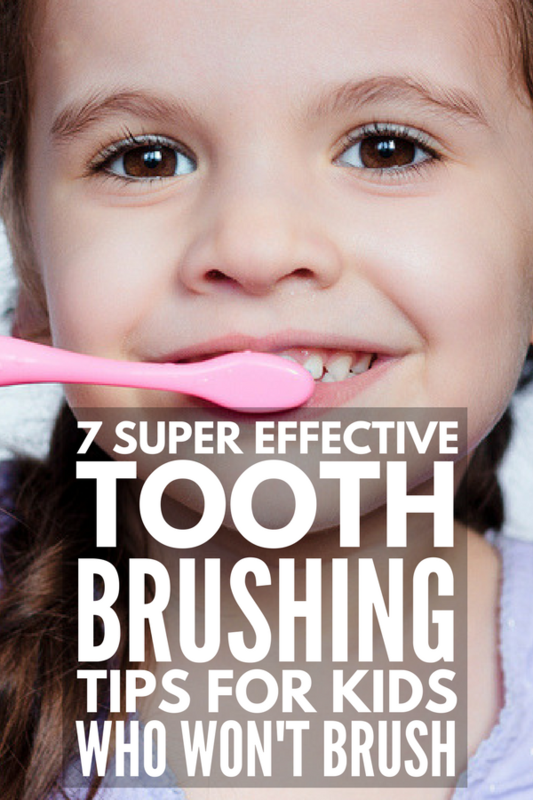 Kids should ideally brush for two minutes, reaching all areas of their mouth and tongue. They should be really scrubbing those back teeth and even the areas of their mouth where their teeth haven’t grown in yet. It’s hard to teach kids how to properly brush, so as a parent, sometimes you need to get in there and do damage control. When babies or toddlers start to brush, they need only a tiny pea-sized amount of paste. Let’s be honest–they’re going to swallow toothpaste, so giving them a small amount to start is ideal. Toothpaste manufacturers know this and make special pastes for kids that won’t hurt if swallowed. Many kids are also sensitive to the taste of mint. They prefer sweet flavors like bubble gum or grape. Again, dentist-recommended toothpaste made specially for children often comes in kid-friendly flavor options. They should use a soft toothbrush sized for their small mouth. There are so many varieties of kids’ toothbrushes out there, you may want to experiment with several different types. Some kids’ brushes play music, some partner with apps, some are electric toothbrushes or feature a timer in the handle. These are all helpful for motivating your kid to brush their teeth. I put it out to my Facebook network to see if anyone else had a toddler that won’t brush their teeth. Wow! It turns out lots of parents struggle with getting kids to use a toothbrush. So many friends had a kid who refuses to brush. Fortunately, it’s easy to help them learn using theses seven effective ways to teach toddlers (and kids) to brush! This suggestion was a great one to ease the stress of bushing time! With so many brushes out there, the process of going to the store and selecting her very own brush is exciting. Brushes come in different characters and with exciting features–some spin, some sing and some toothbrushes (like Grush) play games! My son stopped fighting toothbrush time when I got a battery powered kids spinbrush. –Erica G.
This one was a great suggestion to get a toddler to brush their teeth. Trade off with brushing your own teeth and letting her brush. You can switch off or even try to brush each other’s teeth at the same time (although it’s a bit hard to focus when a toddler is hitting your tonsils with a toothbrush). Taking turns brushing and letting kids brush your teeth is a great way to loosen them up. Let her brush yours if you can brush hers. –Shannon H.
My daughter is 27 months. I brush my teeth while she uses her own brush, then we switch…she brushes mine with my brush, I brush hers with her brush. –Sara H.
This was a big helper for us. With a toddler that won’t brush her teeth, the washcloth method of brushing teeth was just so much easier. Letting kids play with a toothbrush and see how it works really helps. Let your toddler learn how a toothbrush works, what their teeth do and how different things feel on their teeth. Discuss brushing, crunching apple pieces and feeling cold drinks on their teeth, so they get used to the prospect of the brush. If it’s the brush they don’t like let them play with an extra one so they don’t fear it. They can brush dolls or trucks to clean them. Also, you can put something on their toothbrush they like (even if it’s not the healthiest) just to get them used to the brush in their mouth and slowly switch to toothpaste. You will still have to clean it with the cloth afterward until they get use to the brush. –Melody L.
Of course, just like Mary Poppins taught us, everything is more fun when it’s a game. My Facebook fans had some great tooth brushing game ideas for toddlers. These fun games help kids learn how to brush their teeth and make them giggle in the process. My daughter and I used to “race” to see who could brush the longest. And she wrote on the bathroom mirror with a dry erase marker with “winner” hash marks. She always beat me. –Christine D.
Have her lay on the floor with her head in your lap while you sit cross legged, and pretend to play dentist and brush. –Courtney P.
We tell our 3yo there are dragons in her mouth that will eat her teeth and that you have to brush to keep them from eating your teeth. She thinks it’s funny when we “chase” her dragons with the toothbrush! –Taylor J.
I’m mean. I tell them if they don’t brush, the dentist will have to use a drill like Daddy uses to build, in their mouths to fix their teeth. Oh, and they will need a shot. Cruel? A little Effective? Yes. –Romy P.
I mentioned the Grush brush before, but there are lots of other interactive brushes, apps and games you can check out. There are several “timer” apps that help kids brush for an appropriate length of time (or distract them with a video while you get in their mouth with the brush). Of course, books and stories about teeth, the tooth fairy, or kids going to the dentist, always help calm nerves. There’s a book – it’s a Norwegian one called ‘Karius and Bakkus’ and it got me in there to brush!!! And we used those stupid flashing toothbrushes. Also let them brush my teeth. –Joy H.
Disney and Oral-B have this awesome app out. Well, the *concept* is awesome, but the app itself is horrible. You make profiles of your kids, then you scan your Oral-B products. It shows a little picture for 2 minutes while a toothbrush brushes the bubbles off of it to reveal what the picture is. Then the kids get a sticker after the brush. The app is so awful, it crashes all the time, doesn’t open, etc. So why am I recommending it to you? The 3-5 times it did actually open was enough for my son to get over his INSANE fear of tooth brushing. He would scream and scream and cry while it took both my husband and I to get him to open his mouth so we could shove the stupid toothbrush in. After the app, he now brushes (mostly) willingly and without incident. So maybe it’ll work for you, maybe not, but if you can get that app to open and work, I’d give it a shot! –Katie P.
No one ever had to sit on a 10 yr old and brush her teeth for her. Well, not to my knowledge anyway. –Penny L.
If you found these tooth-brushing tips for toddlers helpful, please share them on Pinterest! And if you’re looking for more tips and tricks to help you survive motherhood, please follow our Parenting board where we share all kinds of inspiration!